2018 Off with a Bang! The end of a year routinely sees a slow-down in trianing as folks depart for vacation, focus on holiday planning, and attend more parties than should be allowed in one month :). �The academy remains fully open, until the week of Christmas, but our daily curriculum is relaxed a bit for all levels of training. �Still, you wouldn’t think we stopped the routine beatings, based on the results of January!! Maia Slowinski, currently ranked 2nd in Women’s Y14 Foil for the season in Region 6, took a road trip to D.C. �She competed in the annual “Capitol Clash SYC” and finished 14th of 98!! �After taking second in her pool with a single loss of 3-5, she raced through her direct eliminations, winning 15-14 and 15-8 in the rounds of 32 and 16 respectively. �In the quarters, she met her match and lost to the eventual silver medalist, 8-15. �Just “playing around”, she also took 38th of 106 in Y14 women’s epee. More recently at JFC’s “River City Duel til You Drop”, Slowinski finished second in a small open event against some very tough competition. 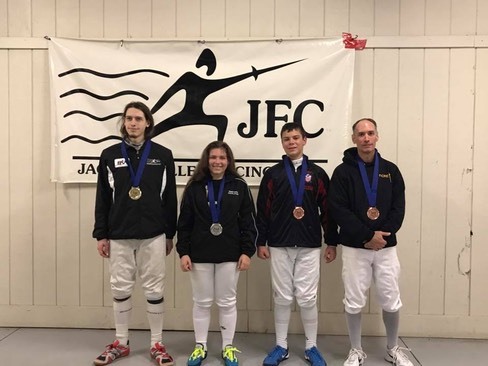 �Fellow WGFA fencer, Nathaniel Vanetta (above right) also competed in the Y14 mixed foil event and advanced to quarters! 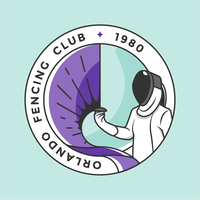 �Kelsey Beck, ranked 26th in Region 6, made the trip to compete in Y14 Foil and the Open, and also made it to the quarter finals! Not a bad start to the new year, but we have so many more competitors who have yet to show their talents. �There are several opportunities from now until the summer to put your training to the test. �Get signed up, and play hard.